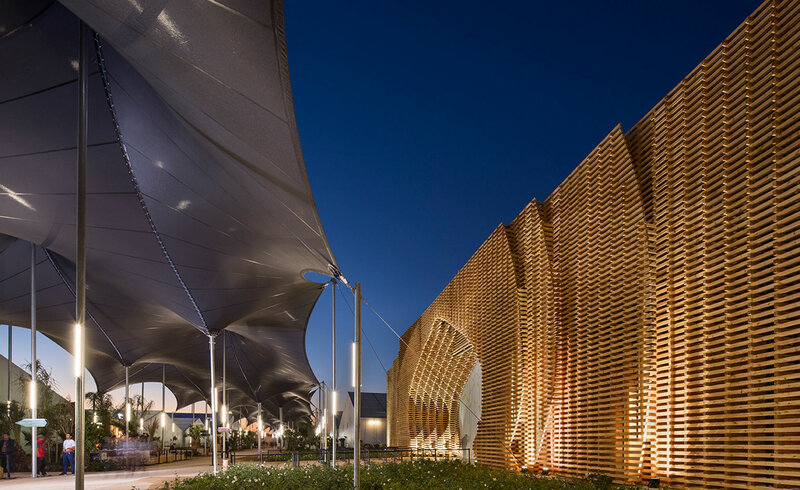 At COP22, this year’s UN Climate Change Conference in Marrakech, delegates talked sustainability while experiencing sustainability – meeting throughout a reusable, recyclable village designed by Paris and Morocco-based architects Oualalou+Choi. For two weeks in November, over 40,000 delegates from 195 countries met in the COP22 village, a mix of temporary structures which were spread out over 30 hectares of land on the southern edge of Marrakech. Using locally-sourced materials, Oualalou+Choi’s design reflected the climate summit’s focus on sustainable development, and at the same time incorporated local architectural traditions in new ways. Taking local, post-harvest festivals as a starting point, the architects constructed a communal space that ran as a seam down the centre of the village under a succession of canopies. ’The design of the exhibition grounds is based upon a temporary urbanism created by the installation of a village of canopies, entirely demountable and reusable,’ the architects explain. The tent-like structure covered 12,400 sq m, linking together two sides of the village under a translucent and waterproof covering. At the gateway to the summit, an impressive, remixed Moroccan archway greeted visitors. Dubbed ‘ark22’, the traditional arched design emerged from a puzzle of interlocking locally-sourced timber. At 12m high and 50m in length, the installation was comprised of identical, lightweight layers that could later be disassembled and reconstructed elsewhere in the city. Inside the village, a series of verandas, patios and atria with accessible rooftops reflected the rural architectural traditions of Morocco. Named ‘agora22’, the structures housed two restaurants and functioned as communal meeting spaces for delegates, where they could chat comfortably outside of the formal meeting sessions. In keeping with the summit’s recyclable remit, ‘agora22’ was comprised almost entirely of reusable particle board, down to the tables and chairs, all of which will be dismantled and reassembled for future projects.